New Year brings in new hopes and promises. Not that the days are going to be drastically different or life is going to take a U-turn, but the notion of a new beginning always brings in some fresh hopes. That is probably why we always wait for New Year day or Birthday to take/renew resolutions, make decisions to become a better person and stuff like that. Its altogether a different fact that I don't keep these resolutions for long, but hey, at least I had the courage to come up with things like 'I will wash clothes every weekend' or 'I will keep track of my expenses and borrow money starting the third week of the month instead of second'. And after all resolutions are meant to be broken, how else can you renew them the year after? I don't think we can afford to take 'new' resolutions every year. It is the age of recycling and optimal usage. And as a responsible citizen of a country with a billion people, I cannot have everything for me...let others also take some of the resolutions. Right on top of my list this year was to stop living like a rat. For long, the place I live was actually just a place to sleep, dump my clothes, it never assumed the role of 'home'. I thought of giving it some character by re-arranging things and cleaning those corners which I last visited in 2007, during a mouse hunt. What helped most was the decision to cook at home. So before the idea got cold and developed mold, I went out and bought everything required to prepare food - true to my other resolution of doing things 'right now'. And after five long years, I got back to the business of 'spoiling the broth'. My friend who has come to stay with me for a while, has proved to be the perfect partner in crime, never saying 'yuk' to the stuff I prepare - even if the egg curry tastes like marinated plastic or the rotis look more like leopard skin. A little support is all that's required to keep the devil-chef inside me happy and innovation-oriented, and I go on making delicacies like wine-omlette! As if not satisfied by this, I have decided to do some backward integration and grow some vegetables at home. There is an attic kind of space accessible from the kitchen, where I am planning to set up my mini-farm. Ironically this is the only spot at home, that receives direct sunlight! 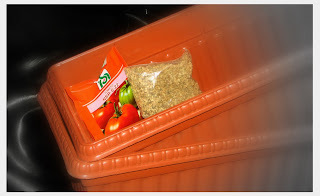 So I went out this weekend and bought two big plastic tubs and some vegetable seeds. The tubs will act as beds for the tomatoes and the lettuce, the first two crops I am going to experiment with. With all the cooking happening, there is a lot of organic waste available now, which I am planning to convert to compost and use in my vegetable beds. I hope I could do this without driving my neighbors mad with the stink. I know I am talking like some big farmer, when I am actually yet to collect some dirt to plant the seeds! I just realized that I have broken one of my resolutions already; the one about Writing sensible blog posts, than talking about 'My new polka dotted pajama' or 'The crow on the lamp post across the road'. But something tells me fun times are ahead! i made all negative resolutions, so hope to keep them. One of my resolutions was to meke new resolutions.